While in Tromso, Bruce met up with Albert Honore Charles Grimaldi who was to become Prince Albert I of Monaco the following year. Grimaldi was on his oceanographic research ship Princess Alice which was based at the Monaco Oceanographic Research Institute. The Princess Alice was the finest oceanographic research ship of her day, and Bruce was delighted to accept the invitation to join the research team. After just four days in Tromso, Bruce was on the way north to Spitsbergen. His main job was to measure plankton and salinity. He was impressed with the deep-sea sounding machine on Princess Alice which he thought would be ideal for the Southern Ocean. Bruce returned to the Mediterranean with the ship where he spent the winter refining oceanographic research techniques. 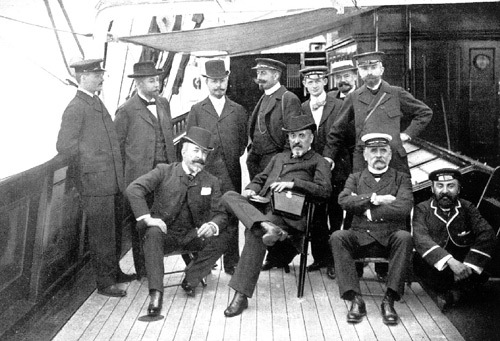 There were several eminent scientists on board Princess Alice. In 1899, Bruce returned to Spitsbergen on Princess Alice but the ship ran aground in Red Bay, Spitsbergen, near a headland which was to be called Bruce Point. The ship floated free but the expedition ended as she had to go south for repairs. The Prince of Monaco was always a friend and supporter of Bruce in his research work. In April 1899, Bruce had applied to join the proposed British Antarctic Expedition. In March 1900 he was accepted by Clements Markham (oresident of Royal Geographical Society) as a senior assistant but by this time Bruce had started preparation for the Scottish National Antarctic Expedition. Prince Albert I of Monaco is generally regarded as the father of modern oceanography. His research ship was superbly equipped. He was the founder of the Oceanographic Institute in Monaco, the Musee Oceanographique de Monaco, and also the Institute Oceanographique in Paris. The Institute is well known for the exploits of Jacques Cousteau, inventor of the aqualung and for many years a well-known television personality. A Russian island later used for testing nuclear bombs. Many obsolete nuclear submarines are now 'stored' here.